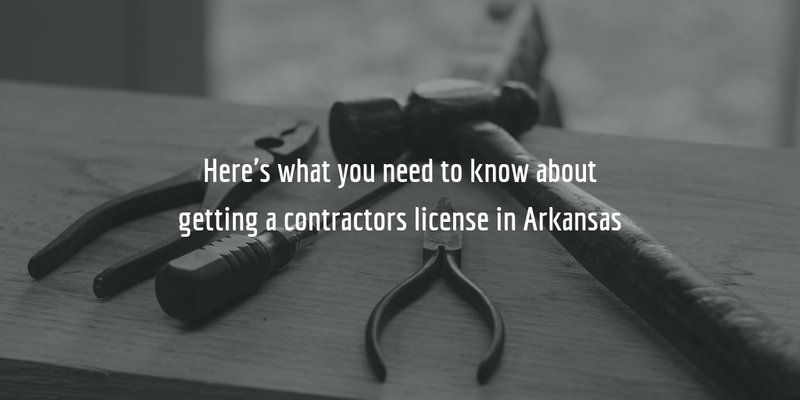 To perform commercial or residential construction work in Arkansas over a certain dollar amount, you must obtain a license from the Arkansas Contractors Licensing Board. To obtain a license, you will need to comply with several pre-licensing requirements. These include providing proof of a certain amount of net worth, passing a test, as well as obtaining a contractor license bond. See below for a detailed explanation of the licensing process for contractors in Arkansas! There are two general license classifications for contractors in Arkansas – a commercial license and a residential license. These are further subdivided into specific classifications. Depending on the classification you choose, requirements for getting licensed may vary slightly. Commercial licenses can be either restricted (permitting work on projects up to $750,000 that are not limited to but include materials and labor) or full licenses that permit work on any type of commercial project. Contractors licensed in one of the classifications between 1-7 can also perform any specialties associated with their classification. Contractors who have a specialty license can only perform the functions of that specific specialty. According to The Rules and Regulations of the Contractors Licensing and Bond Law, to apply for any of the above licenses, you need to have at least 5 years of experience in the type of work you wish to perform! According to the Rules & Regulations of the Residential Contractors Committee, to apply for a residential builder’s license, you need to have at least 4 years of experience in the building industry. To apply for a residential remodeler’s license, you need at least 2 years of experience. Once you have chosen the license type you wish to apply for you can proceed with completing the application and licensing requirements. Application and pre-licensing requirements for commercial and residential licenses vary slightly. See below for a list of requirements you need to complete and comply with before you can apply for your license and get approved. Applications must be submitted to the Licensing Board at least three weeks prior to a board meeting, in order to be reviewed and approved. Once the Board reviews your application, and if you have fulfilled all the necessary requirements, your license will be issued. As with commercial licenses, applications for these licenses must be posted to the Arkansas Residential Committee three weeks prior to a committee meeting to be reviewed at that meeting. If you are applying for a commercial license, you may wonder why you need to submit a surety bond, and how you can obtain one. See below for more information about the Arkansas contractors license bond. Applicants for a commercial contractors license in Arkansas must obtain a $10,000 surety bond as financial security before they are issued their license. According to the bond form, the bond is conditioned on the contractor’s compliance with the Arkansas State Licensing Law for Contractors. The bond’s function as financial security is to guarantee that if a bonded and licensed contractor does not comply with the conditions of the bond, and thereby causes any losses or damages, compensation may be sought by the Contractors Board. Such compensation can be as high as the full amount of the bond. Typically, when a claim is made against a bond, the surety will compensate claimants in the amount determined by the Board or a court, and the contractor must then reimburse the surety in full. The cost of getting bonded is not the same as the bond amount though. To get bonded, you must pay a bond premium, which is typically a small percentage of the full bond amount. The exact rate of your premium depends on your personal credit score and other financial which the surety will review prior to offering you a rate on your bond. Applicants with high credit scores can often get bonded for as little as 1% of the total amount of this bond. So, if you are offered a rate of 1.5% on your bond, the cost of your bond will be $150. For an exact quote on your bond, complete our bond form and we will get in touch with you shortly!